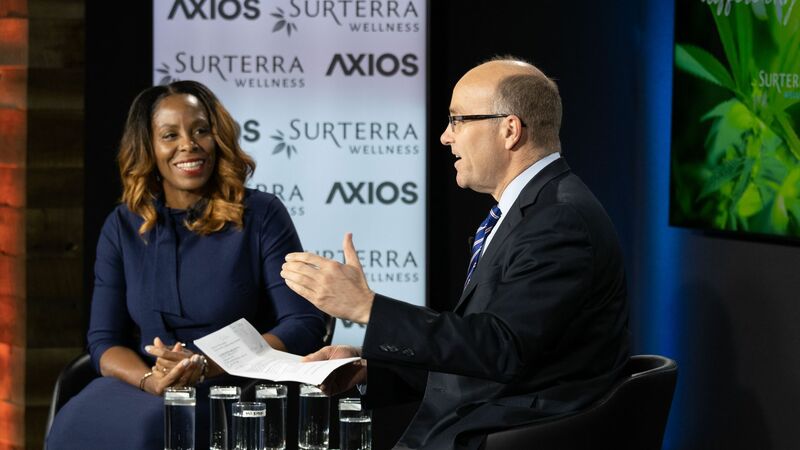 Wednesday morning, Axios executive editor Mike Allen hosted a series of conversations exploring how cannabis and its extracts are shaping the future of health and wellness. Why it matters: While cannabis is steadily making its way into the health and wellness mainstream, choppy state-dependent regulation has made it difficult for the industry to truly take off. Wrigley, who is the chairman and CEO of Surterra Wellness — a rapidly growing health and wellness company focused on cannabis products — kicked off the program with a View From the Top segment led by Axios senior vice president Ali Rubin. Wrigley unpacked what he sees as the future of medical cannabis and how it could help mitigate some of America's most pressing health crises. How cannabis can contribute to society: "It's a substance that allows for tremendous health benefits," he said referring to cannabis' ability to ameliorate epilepsy, chronic pain, anxiety and sleep disorders. "It's about quality of life for people." Cannabis as an alternative to opioids: “There are people who want to avoid chronic pain and use cannabis instead of opioids." The industry's obstacles: "We're in an unusual regulatory environment. ... It's creating real challenges in the market place." Witte, whose company Recess makes drinks infused with CBD oil (a non-psychoactive compound made from hemp), sat down with Axios' Mike Allen to explain the mission of his company and how it taps into an "anxiety economy" spurred by our fast-paced, high-intensity world. The future of CBD: "It will eventually become an everyday product ... like whey protein." The bipartisan support for hemp legalization: "Everyone wants this to happen. I bet my life on the Hemp Farming Act introduced by Mitch McConnell. ... [It] basically says we want hemp to be the future crop of America." Rep. Plaskett, who chairs the House Subcommittee on Biotechnology, Horticulture and Research, explained what's holding Congress back from pushing cannabis legalization forward. The role of her subcommittee in the legalization debate: "We’re trying to stay in our lanes so that we’re not bleeding into others. Legalization will be up to the judiciary." Congress' concerns: “What you’re hearing from members is concern not about the benefits, but the long-term detriments. They have real concerns about that." Rep. Joyce, who co-chairs the Congressional Cannabis Caucus, discussed who should oversee the regulation of cannabis and echoed Wrigley's perspective on the role it could play in combatting opioid abuse. Why legalization should be a states' rights issue: “We need to have research done, we need to have regulations in place. States are doing that." Thank you Surterra Wellness for sponsoring this event.